New York City, N.Y., May 1, 2018 / 01:36 pm (CNA/EWTN News).- Alfie Evans, a disabled British toddler who died Saturday after a contentious legal battle over his treatment, captured the attention of Catholics around the world, including Pope Francis. While he suffered from undiagnosed neurological problems at Alder Hey Children’s Hospital, Alfie’s parents sought to treat him elsewhere, while physicians opposed the move, arguing that continuing treatment was not in the child’s best interests. The case raised questions about the right of parents to make healthcare decisions for a child, about ‘ordinary’ and ‘extraordinary’ means of treatment and life-support, and about the treatment of patients with disabilities. 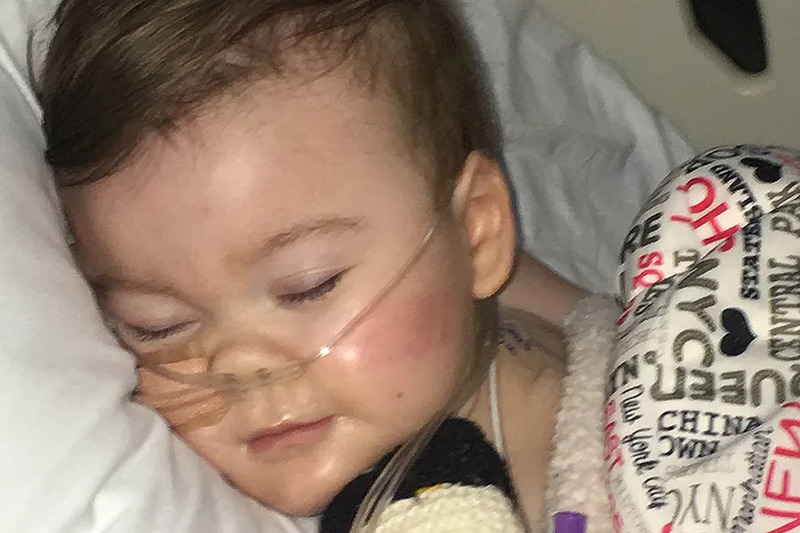 Alfie Evans died after his parents lost legal appeals, despite diplomatic interventions supporting their efforts. He lived, unexpectedly, for five days after physicians removed life support. Charles C. Camosy is associate professor of theology at Fordham University and author of several books on Catholic ethical reasoning. Last week, he authored “Alfie Evans and our moral crossroads,” published by the ecumenical magazine and website First Things. In an interview with CNA editor-in-chief JD Flynn, Camosy discusses some of the ethical aspects regarding the case of Alfie Evans. Some of the discussion regarding Alfie Evans’ situation centered around ‘extraordinary’ and ‘ordinary’ kinds of life-saving treatment. Questions were frequently raised about whether Alfie was receiving ‘ordinary’ or ‘extraordinary’ treatment by physicians at Alder Hey Children’s Hospital. How does the Church understand the idea of ‘ordinary and extraordinary’ medical treatment? This is an essential aspect of the Church's teaching, especially at the end of life. ‘Ordinary’ and ‘extraordinary’ have nothing to do with the frequency with which a particular culture offers a treatment. Ordinary treatment, rather, refers to treatment that is morally required while other kinds of treatment- extraordinary treatment- may be refused or withdrawn–so long as one is not aiming at death, and has a proportionately serious reason. The distinction is largely accepted by most medical communities today, and was pioneered by the Catholic Church in the late Middle Ages when thinking about battlefield medicine and whether or not a soldier could refuse a life-saving amputation without aiming at their own death. The answer was "yes," and the intense pain of an amputation without pain medicine was the proportionately serious reason. In such a case, death is merely foreseen but not intended. The Church generally allows individual patients or their surrogates (with a strong preference for the family) to make this kind of moral judgment for themselves, unless it is perfectly obvious that one is aiming at death or that there is nothing like a proportionately serious reason. It is important to mention that giving someone food and water, even through technical means, is not considered means of "medical treatment" and is not a medical act according to Catholic teaching. It is care which comes from basic human decency. You wrote in First Things last week that disabled patients sometimes suffer from "slow coding" or "show coding" in hospital settings. Can you explain what that is? I wouldn't say it happens often, but it happens often enough that medical ethicists think it is worthy of debate. Sometimes a physician and/or other members of the medical team believe that further intense treatment of a disabled child is inappropriate. Sometimes they may have a point–like when pounding on the chest of a child after cardiac arrest is likely to do little more than break her bones. But sometimes, as I believed happened in the Alfie Evans case, it is because physicians and/or other members of the medical team think the child is so disabled–perhaps due to a devastating brain injury or disease–that further life is not in the child's interest. Now, a medical team and hospital is rarely forced into caring for a patient, so one option is to refer the parents to another medical team or hospital who will treat the child. But sometimes, despite agreeing with the parents that the child is a "full code" and everything will be done, the physician and/or other members of the medical team will only make a half-hearted effort at treating the child. This is called a "slow" or "show" code, and some medical ethicists defend the practice. But as I mentioned in my First Things piece, that is only one way that health care providers can and do manipulate parents to get the outcome they want. Numbers can be fudged. Studies can be selectively referenced. Directive language–especially about disability–can be used. Health care providers have a ridiculous amount of power. We ought to be far more critical in holding them to account. You have discussed the concept of "ableism." What does this mean? Ableism describes a particular kind of unjust discrimination. In this case, it is discrimination in favor of those with able bodies and minds. Physicians tend to be at particular risk for ableism and often rate quality of lives of disabled patients worse than the patients do themselves. How might those biases have impacted decisions made about the medical care of Alfie Evans? The treatment Alfie was being given were working quite well, doing precisely what it was designed to do. He needed help breathing, but so do many disabled people. His brain damage was profound, even to the point where it is likely he wasn't conscious of being intubated, and was almost certainly not suffering in any meaningful sense. And though he was likely to die, he was never diagnosed with a disease and we have absolutely no idea how long he would have lived had he been given treatment that is standard in other countries. Given all these facts, the concern that Alfie's doctors and Judge Hayden had with his brain seems impossible to miss. Though misleading euphemisms were offered about other matters of concern (as they almost always are when the truth is difficult to name), it is very clear to me the decision was made on an ableist basis. The decision wasn't made because, like getting one's leg cut off without pain medicine, the treatment was too burdensome. It was made because Alfie's brain was so damaged that his life was no longer consider dignified–and it was [judged to be] in his best interests to die. His death was not merely foreseen. Those who wanted Alfie's life support withdrawn were not happy that he started to breathe afterwards. (And, indeed, there is at least some evidence to suggest that Alfie was given drugs after extubation which made it more difficult for him to breathe.) On the contrary, the point was for that for Alfie to die was in his best interest. This is unlike the amputation example where, if somehow the soldier lived after refusing treatment, everyone involved would be thrilled. The soldier's death was never part of the object of the act. Not so with refusing to treat Alfie Evans. What reasoning did some Catholic commentators proffer to support Justice Hayden's decision? What is your response to that reasoning? Catholic commentators who support Hayden's decision are right about a lot of things. They are right that the Church doesn't make an idol out of preserving life. In fact, we invented the tradition which resists that kind of idolatry. They are right to say that we don't simply allow parents to do whatever they want with their children in a medical context–especially if it could reasonably be construed as abuse. They are right to say, if it was really about burden of treatment, that Hayden's decision could be consistent with Catholic teaching. But I fear much of the commentary has been too deferential to those who hold power in this case: the doctors and the jurists. They deserve a far more skeptical eye, especially given the power they wield over the life and death over the most vulnerable. Catholic teaching never permits aiming at the death of a patient, either by action or omission. This case, again, was not about the burden of extraordinary treatment, but about the disability of a child. Our job as Catholic Christians is to see the face of Christ in little Alfie–not to accept the position that his treatment was futile because his brain damage prevented him having certain abilities. And when there is legitimate disagreement about what is in a child's best interest, and abuse is not part of the scenario, the Catholic position is to defer to the parents. They know the child and his interests best. The three of them belong to each other in a special and unique way. The doctors and judges will not be visiting Alfie's grave. His parents will be. First, the charge of "vitalism" has been thrown at people who didn't want action aiming at Alphie's death. It is not always clear what this charge is trying to identify, but if it is the position that human life is valuable as human life–regardless of what it can "do" or how much it can "produce"–then many of us, I hope, will plead guilty. A human person is a living member of the species Homo sapiens. Nothing more. Nothing less. Second, it has been a shame that so many people have tried to read this issue through the life/choice abortion binary. Once again, it appears, the abortion wars have infected a very different kind of moral and legal issue. Pro-lifers have, for some time now, been concerned with vulnerable lives beyond birth. Often in close cooperation with disability-rights groups, we fight against euthanasia. We fight against human trafficking laws. Many of us reject the death penalty. We are deeply, concerned, obviously with infanticides perpetrated by people like Dr. Kermit Gosnell. We fight for vulnerable human life, especially when–as Pope Francis warns–our throwaway culture treats it like so much trash. There is absolutely no reason that the fight for Alfie and others like him needs to be about abortion. People who disagree about that issue should be able to agree that Alfie matters just the same as any other little boy, and that his parents ought to have been able to pursue his best interest in ways that other parents are permitted to do. What might the life and death of Alfie Evans portend for the future of healthcare ethics and policy? What should it teach Catholics about prophetic witness? We are at a very dangerous moral crossroads. Before the attention that the Alfie Evans and Charlie Gard cases brought with them, these practices were hidden away, with little-to-no public scrutiny. What will we do now that these practices have been brought to light and are defended by some doctors and judges? Will we step up and be heard? Will we be on the side of the disabled and the parents who fight for them? Or will we capitulate to ableist assumptions and the practices of the powerful? Pope Francis was on the right side of both the Charlie Gard and Alfie Evans cases, resisting the throw-away culture's attempt to dispense with them. Let us get behind the Holy Father and continue to resist the throw-away culture by standing up for the disabled, in this case and the similar cases which are sure to come. Paris, France, Jun 6, 2017 / 09:57 am (CNA/EWTN News).- A man was shot after an apparent hammer attack on police officers at Paris police headquarters next to the Cathedral of Notre Dame on Tuesday. Dublin, Ireland, Jul 10, 2017 / 04:30 pm (CNA/EWTN News).- Former Irish soccer pro Philip Mulryne was ordained a priest of the Order of Preachers, or Dominicans, on Saturday.